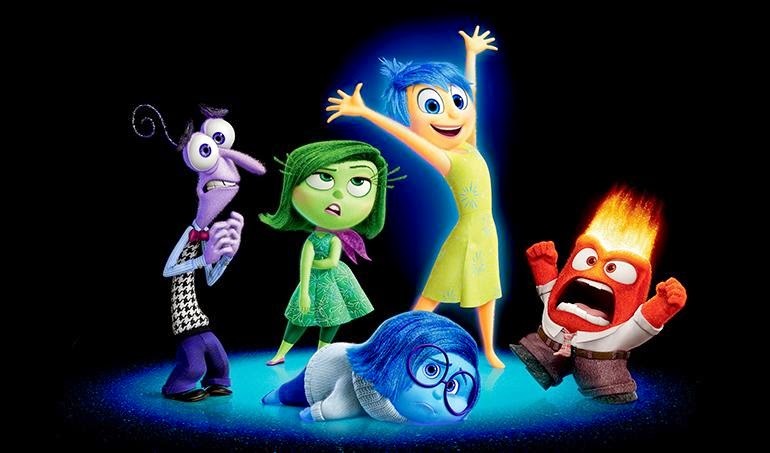 Movie Comment: Disney•Pixar’s Inside Out + Insider Access – BOBBY JAMES. Yesterday was a gloomy, rainy day in St. Louis. Naturally, I found myself online looking up cinema show times. Then, I noticed something I never had before – a listing for “Insider Access to Inside Out,” a partnering between Disney and Fathom Events to debut Inside Out early with special perks. One theater (Regal Entertainment) listed a ticket to the event for $27.95, another (Wehrenberg) offered it for $22.00. Disney and Fathom Events are bringing Disney•Pixar’s highly-anticipated Inside Out to theaters in a special advanced screening that includes exclusive behind-the-scenes footage from Pixar Animation Studios, the Lava short, and exclusive Live Q&A with director Pete Docter, producer Jonas Rivera and the voice of Joy, Amy Poehler. Event attendees will also receive a limited edition Inside Out commemorative poster and lanyard that includes a special code for access to digital extras. My initial reaction was “$28!” I settled down after that and as the day went on, curiosity had taken full hold. I went. At the box office window, I said, “One for the Inside Out Insider Access please.” The attendant only responded, “It’s expensive.” I said, “I’m aware. Thank you.” Pass in hand, I proceeded to Auditorium 11 (Coincidentally significant or planned? “Riley” is 11 years-old in the story). On my way, I received the lanyard (which, might I say, is pretty cool!) – but no commemorative poster (more on that in a minute). Once inside, the fun really began. The video tour of Pixar Animation Studios was incredible! I’m convinced, the animators have the best offices in the entire world and John Lasseter’s figurine collection is an enviable thing! I particularly loved the backstories about the building (ex. why there’s only one restroom) and the exploration of the various departments. It was fun to have a sneak peek at an animation sequence from The Good Dinosaur and to see the room where Toy Story 4 is being developed! Let’s get to business shall we? After all, this is really why you’re checking out this post. 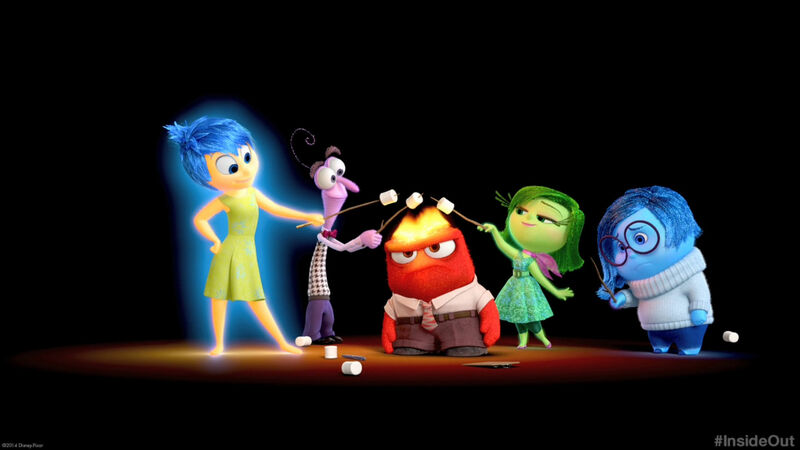 Inside Out, Pixar Animation Studios’ fifteenth animated feature, is brilliant. 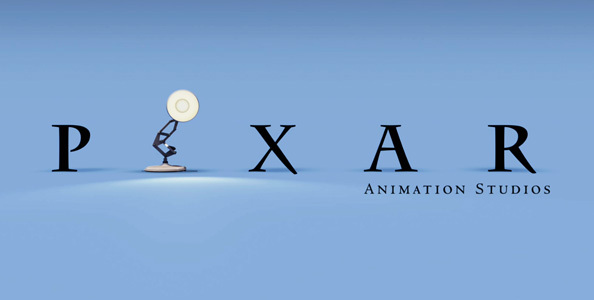 It’s an original and thought-provoking idea, complete with all of the caring, detail and emotion one has come to expect from Pixar properties. The adventure, directed by Pete Docter (Monsters Inc., Up), centers on 11 year-old “Riley” (Kaitlyn Dias) and her emotions. Turmoil ensues in Headquarters when she’s uprooted from her Midwestern life because her dad takes a job in San Francisco. I’m not sure I can adequately describe how brilliant this movie really is. Docter clearly has a knack for creating authentic emotion in animation. I felt everything Riley felt, and in doing so, I recalled many of my own memories from the past. Most importantly, I could relate to the ordinary circumstance of moving – changing schools, leaving friends behind and having a new house (to name just a few). In hindsight, such an event may seem trivial, but at the given time, it’s exciting (“Joy”), sad (“Sadness”), nerve-racking (“Fear”), maddening (“Anger”) and perhaps disgusting (“Disgust”) – at least it’s all of these for Riley. In the post-screening Q&A, Amy Poehler (voice of “Joy”) said, “Riley is extraordinary because she is an ordinary girl.” I couldn’t agree more and I applaud the decision to tell an ordinary story with extraordinary capability. This film presents a welcome celebration of feeling, while giving us some really great animated characters, of which “Bing Bong” is my favorite. 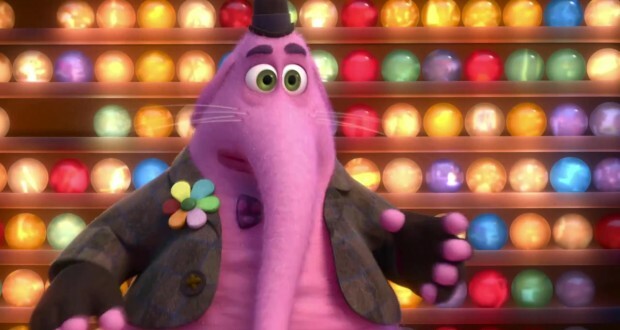 Voiced by Richard Kind, “Bing Bong” is a character every audience member can relate to on some level (if you can’t, you’re only lying to yourself!). He’s brightly colored and is an elephant-cat-dolphin creature made up almost entirely of cotton candy. Tell me you don’t already love “Bing Bong.” And to think, you haven’t even met him yet! Kind’s voice gives “Bing Bong” an endearing sense of life experience and soul – and one line he delivers will have you feeling similar to how you felt during the “Married Life” montage in Up. Way to go Docter. Thanks a lot. The primary emotions for this adventure are “Joy” (voiced by Amy Poehler) and “Sadness” (voiced by Phyllis Smith). Their mingling works incredibly well as Poehler and Smith play off of one another with finesse to create a balanced emotional dynamic. The real magic happens though, when “Bing Bong” joins the pair. During their exchanges, life changes for Riley while “Anger” (Lewis Black), “Fear” (Bill Hader) and “Disgust” (Mindy Kaling) are left in charge of Headquarters. While you’re busy feeling for this 11 year-old girl, you may find yourself feeling for yourself and wondering about where your own memories are. Don’t be surprised if some things you’d rather not remember creep out from the darkest corners of your mind. The post screening Q&A was insightful. I loved the exploration of the creative process behind Inside Out. I also loved the little fun-facts about “Joy” being the hardest character write because she kept receiving negative criticisms at test screenings. The end result shows just how determined Docter was to get “Joy” right. When in doubt – just create a character inspired by Audrey Hepburn and Bugs Bunny! BRAVO! Those commemorative posters I mentioned? Nobody had a clue – and most of the people in the theater didn’t even know such a thing existed. But I did – they found them and I now have a few – and let me tell you, they’re pret-ty awesome. If you have a chance in the future to have this “Insider Access” to a movie – do it. It’s money well-spent. It is for me anyway, because I’m reinvigorated to work in Hollywood now – to share some of my own stories!